Information on geological sites in Essex is available on the Essex Field Club’s site database. Over 450 sites of national, regional and local importance have been identified in Essex, all of them having some connection with geology, geomorphology or Palaeolithic archaeology (see Lucy, G. (2007) A Mammoth in the High Street: a proposed gazetteer of geological sites in Essex. Essex Naturalist (New series) 24: 21-28). The task of compiling this information and loading it on the database will take time and only a proportion of sites have so far been added, all provided by Gerald Lucy. The best way to search the site database is from the Geological Sites Search where you can choose the local authority district you are interested in from the drop down list. If the district is not listed it means that no site information for that district has yet been added to the database. For the purpose of this exercise there are 15 districts (12 in Essex, the unitary authorities of Southend and Thurrock, and the Greater London area east of the River Lea). Once you have selected a district, a list of sites in that district appears. Click on a site and the site information is displayed. Alternatively the sites in the district are available as a PDF file which can be downloaded and printed as a Gazetteer of Sites. Each site entry contains the name of the site, the place name (the nearest town or village), the grid reference and at least a paragraph of text. Photos are included where available. References are also included (the full list of references will be available on this page as soon as it has been completed). A useful innovation is a link which will take you directly to an aerial photograph of the area with the site marked. The project has only just commenced and so for the time being it may be easier to search using the Geology Site Map which shows a map of Essex with the sites marked where there is information on the database. Click on the site to display the site information. What types of site are included? The sites on the database are of national, regional and local importance connected with geology, geomorphology or Palaeolithic archaeology. They are mostly landforms, quarries, pits, road and railway cuttings, erratic boulders, temporary excavations, shingle spits, cliffs and foreshores. Most inland sites eventually become infilled, overgrown, obscured and forgotten with no evidence of the site visible on the surface; therefore the database is not just a record of what can be seen in Essex today but is also a valuable record of past discoveries. We have defined geological sites in the widest sense which means that not all the sites listed are strictly geological (such as a pit or quarry) but all have a geological connection. They include buildings, walls, graves, town geology trails, wells, springs, spas, boreholes, deneholes, plaques, landslips, viewpoints, and even meteorites and meteors. We have also included significant or interesting Palaeolithic sites because such sites are, by definition, also of geological interest. In Essex there is evidence of humans at many important Ice Age sites, either in the form of flint tools or butchery marks on the bones of animals that were hunted for food. During this early period humans were just another predator competing for food with other carnivores and archaeologists, palaeontologists and geologists are now working together to make sense of these sites. Further information on the geological sites project can be found in the paper by Gerald Lucy entitled ‘A Mammoth in the High Street: A proposed gazetteer of geological sites in Essex’ published in the Essex Naturalist Volume 24 (2007). Other pages of the Essex Field Club’s website relate to geology. 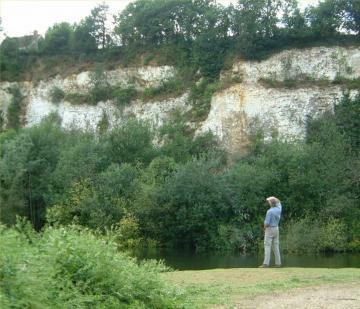 See also What is Geodiversity, the Geology of Essex and Essex Field Club Geology Group.